Wilderness.net - Wilderness Library Image #2068: This is curt and fred goodsell, a refuge volunteer who drove us to our starting point. they are standing next to an emergency beacon placed by border patrol in the desert. emergency beacons are scattered throughout the desert for illegal migrants crossing the desert who may get into trouble and need rescuing. pushing the buttom summons a border patrol helicopter that will come and give emergency medical attention. Description: This is curt and fred goodsell, a refuge volunteer who drove us to our starting point. 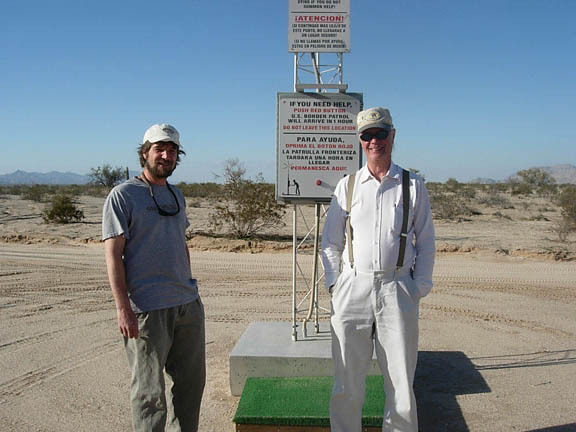 they are standing next to an emergency beacon placed by border patrol in the desert. emergency beacons are scattered throughout the desert for illegal migrants crossing the desert who may get into trouble and need rescuing. pushing the buttom summons a border patrol helicopter that will come and give emergency medical attention.